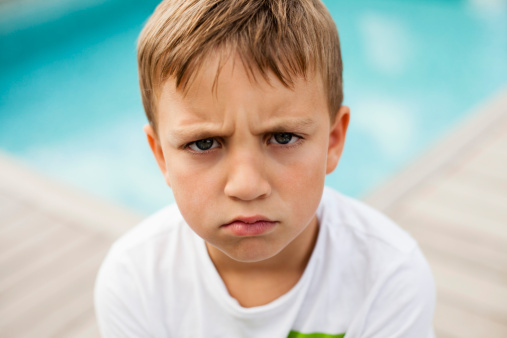 "This response-cost strategy is appropriate for younger students who are verbally defiant and non-compliant with the teacher." (InterventionCentral, 2015). How to Implement "Points for Grumpy"
Decorate two coffee cans, one with the student's name and one labeled "Grumpy" (and pictures that represent grumpy behavior). Cut a slot in the top of both containers. Create a list of rewards and figure out how many good points the student needs to receive to get a reward. Discuss the expectations with the student, as well as the repercussions. Once the intervention is started, use the student chart to record good behaviors. "When a student becomes uncooperative about losing a point, make sure to stay calm and avoid addressing the student in a ​confrontational manner. Keep deducting good behavior points even if the student is being extra defiant. Some students are unable to be part of a point behavior management tool due to becoming too upset for losing points. " (InterventionCentral, 2015). This behavior intervention is used throughout the entire day within every content area. There are opportunities for specialist involvement as well. If a student is having a great day in physical education, for example, the student can put a token in their jar when they get back to the classroom if the physical education teacher says so. "As the student shows that he or she is able to meet your behavioral goals and keep most or all of the 'good behavior' points, gradually drop the maximum number of points allocated each day." (InterventionCentral, 2015). "You can adapt this program for use with older students. Use points instead of tokens. Also, in place of an imaginary figure ("Grumpy"), you can randomly pick other students in the class each day. Inform the target student that, for each instance in which you must approach that student for non-compliance or disrespectful behavior, you will award one of his or her points to the randomly chosen classmate-who will be able to 'cash in' these points for rewards." (InterventionCentral, 2015). Remember: This intervention does not replace the disciplinary action plan you already have set in your classroom. In this video the professor is discussing how to address children who struggle with behavior issues. Throughout the video she keeps reiterating that teachers need to follow their behavior plan accordingly and monitor results. This is true for "Points for Grumpy." Stick with it and it will be beneficial. There needs to be a conversation between the student and the teacher discussing "Points with Grumpy" before putting it into use. Who does this intervention work for? This intervention works for students who are defiant and need to have extra motivation to listen and be respectful. This can be helpful for impulsive students, socially struggling students, students who don't listen, and students who are noncompliant. This is a great intervention for students who need to work on being respectful to their superiors. "Briefer, targeted behavioral interventions can improve social communication in toddlers and young children. Here, benefits can be seen when interventions are delivered for at least 6 months." (AutismSpeaks.org, 2015). This behavioral intervention can be used for short periods of time or longer if needed. The student will be constantly reinforced with behavior reminders throughout the day. Common vocabulary such as "respectful" and "disrespectful" or "weak" and "strong" will be used during this intervention. It will become structured within the student, so that eventually the student will use respectful language and interactions without the need for an intervention. Gradual release or scaffolding will occur. A gifted student who has defiant behavior is in my kindergarten class. She will benefit from this intervention because it is incorporated throughout the entire day. Her parents have discussed with us about using the words "respectful" and "disrespectful" as common vocabulary terms in the home and school setting. When she is making a disrespectful choice or showing disrespectful behavior, she will have to put some points in the "Grumpy" bin. We will need to discuss respectful behavior and reinforce respectful behaviors as well. Social skills and personal space awareness are also difficult for her, so this will be important to address with this intervention. As stated before, this intervention will take place along with the classroom management tool (Class Dojo). ​Research Confirms Benefit of Behavioral Interventions. (2011, November 15). Retrieved October 14, 2015.